You need a cheat-sheet to figure out how to get what you want out of any new game these days. Assassin’s Creed Syndicate is no different. Here’s what we’ve figured out so far about navigating your way to buying the game. Syndicate will be the next major Assassin’s Creed game, moving the series to Victorian London. It was officially announced today for a fall release. As is standard for games from big publishers like Ubisoft, you can already pre-order the game and get some bonus content for your efforts. The bonus if you pre-order from GameStop are missions involving Charles Darwin and Charles Dickens. 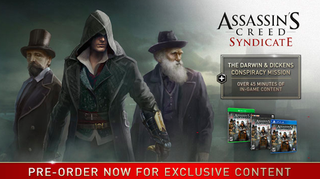 Pre-order Assassin’s Creed Syndicate and receive the Darwin and Dickens Conspiracy Mission! If you are the type who gets angry about publishers carving out part of their game for retailer-specific incentives, well, I hear you, but do know that Ubisoft usually makes these missions accessible after the fact, usually several weeks after release—albeit as paid DLC. GOLD EDITION INCLUDES GAME + SEASON PASS - featuring a major expansion plus digital content & exclusives. What can we conclude? Are Dickens and Darwin only showing up in pre-order missions? I hope not! I’ve asked Ubisoft PR about the season pass and about the bonus missions, but I’ve not heard back yet. Probably never will, since they don’t answer our inquiries these days. Oh well, let’s look at the history. Assassin’s Creed games used to lean toward the PlayStation, which would get 60 minutes of missions that wouldn’t launch for Xbox. ACIV, for example, had exclusive Aveline missions. But as of last year’s AC Unity, the franchise stopped leaning PlayStation and had content parity across the consoles. The Darwin/Dickens missions are the kind of thing that’d formerly be tied to PlayStation, so it seems likely they’ve been shifted to be pre-order-centric missions. And, again, they’re likely to become paid DLC down the road. As for the season pass, the series has typically had some meaty single-player post-release expansions, the best ones actually made by Ubisoft Quebec, the studio now leading the Syndicate project. The Quebec studio led the development of ACIII’s three-part alternate history expansion about a bad-guy George Washington and AC IV’s slave-liberating adventure Freedom Cry. Given Syndicate’s exclusion of a multiplayer mode, Syndicate’s season pass is likely to also be single-player content. But why are we talking about season passes and pre-order incentives now? It’s the way of big publishers and it doesn’t seem like it’s a way that will bend—even when the game they’re trying to get people to pre-order is a sequel to a game that was notoriously glitchy and in need of so many post-release patches that the publisher eventually apologized, nixed their season pass and gave their post-release DLC out for free. Pre-buyer beware and all that.